**Accepted Offer - Contingent But Accepting Back-Up Offers** You will love this delightful farmhouse with loads of old-fashioned charm and breathtaking country views! This 3-bedroom, 2-bathroom home has a 2-car garage with an attached workshop and gives you over 1700 SqFt of spacious living. Imagine cuddling up to a cozy fireplace with a good book! Every night, drift off to sleep to the subtle sounds of the country, then wake up to a spectacular sunrise! 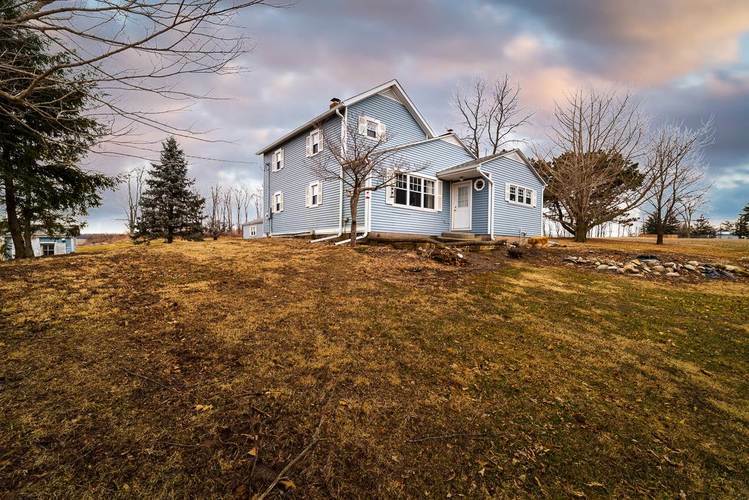 All of this situated on a partially wooded 2 acre lot with beautiful rolling terrain. Not to mention, other great features such as a formal dining area, updated bathroom, 2 wood burning fireplaces, built-ins, lots of storage, privacy and much more. Most recent improvements include: Roof (2007), windows (2007), geo-thermal (2009), electrical panel (2014), well pump and bladder tank (2016), repointing of basement foundation (2016), upstairs drywall and insulation (2017), carpet (2017), appliances (2018) and water heater (2018). All kitchen appliances to remain! Conveniently located near Eel River Golf Course, Lake Everett, Blue Lake, Tri-Lakes, Chain O'Lakes State Park, Paige's Crossing Family Entertainment, schools, shopping and other amenities. What more could you ask for! Directions:33 N to CR 150 (Carroll Rd) turn left, continue 2 miles past Johnson Rd house on the right. Listing provided courtesy of Anthony REALTORS.